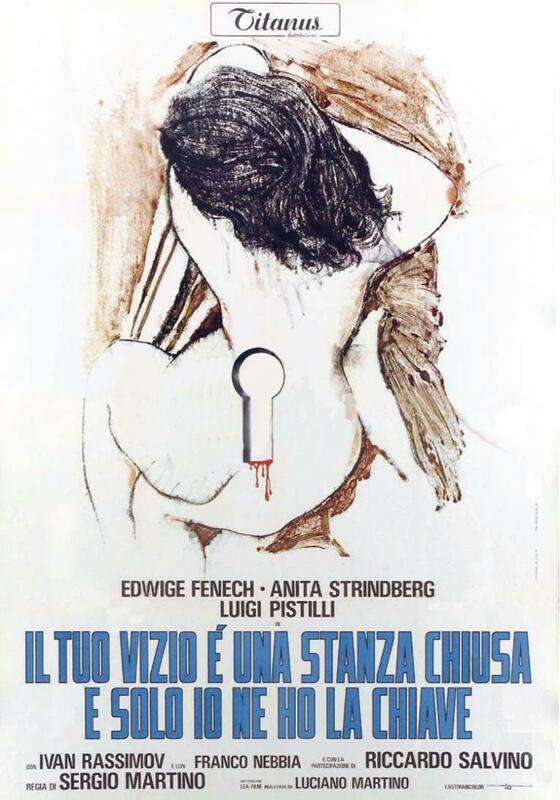 With the Italian giallo films, you can expect three things: breasts, blood and a title consisting of a string of words you would never expect to be the name of a film but which somehow works. I mean, based on the titles, shouldn’t these all be different movies? 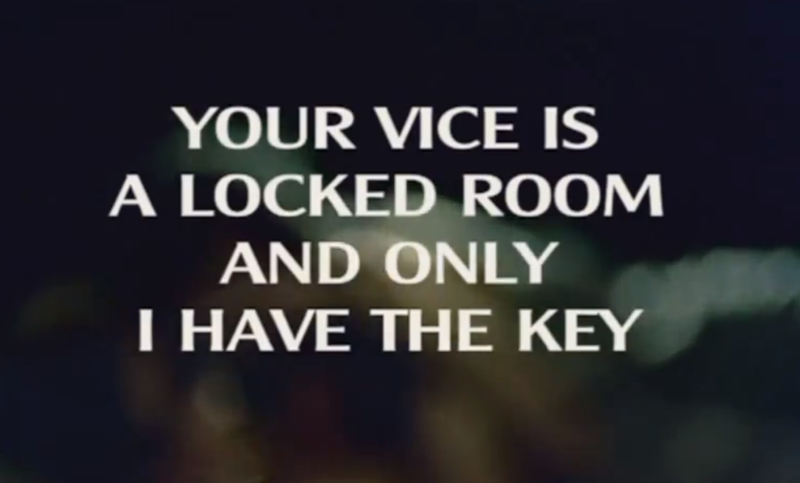 (France, for the record, just translated the Italian title directly into French: Ton vice est une chambre close dont moi seul ai la clé.) You may realize that none of these titles really give much of an idea what the film could be about. You may also wonder why foreign language releases would have discarded such a distinct, evocative title, which you may suppose has a direct relation to the plot, because why else would that be the title? But here’s the weird part: It actually doesn’t relate especially to the plot. It comes from a 1971 giallo that also stars Edwige Fenech — Blade of the Ripper (a.k.a. The Strange Vice of Mrs. Wardh3), in which she receives a threatening note that contains that message. The title ties in with the film in only a vaguely thematic way, even though it sounds like something that would directly figure into the story, I Know What You Did Last Summer-style. It is at times like this when I trip over myself trying to figure out how people decide to name anything anything. And the whole film is viewable in one post on YouTube, in case you’re interested. If Google Translate knows its Greek. I don’t know enough about German to tell if this is The Killer Who Is a Nymphomanic or the The Person Who Kills Nymphomaniacs. But also a.k.a. Den djævelske kniv (The Demon Knife), Der Killer von Wien (The Killer of Vienna), Epikindynoi anthropoi (Dangerous People), Hartstochtelijke nachten van Mme Wardh (The Passionate Nights of Madame Wardh), Lâmina Assassina (Blade Killer), La perversa señora Ward (The Wicked Mrs. Ward), Les nuits folles de Mme Wardh (The Crazy Nights of Mrs. Wardh), Mannen med rakkniven (The Man With the Knife Missed Razor), O amartolos kyklos ton ekviaston (The Sinner Cycle of Extortion), Szerelmi vérszomj (Love Bloodlust), Uma Faca na Escuridão (A Knife in the Dark), and as it was simply known in the U.K., Next! I was surprised you didn't comment on Edwige Fenech being the inspiration for the name of Mike Myers' character in Inglourious Basterds, given your proclivities. You know, I'd actually forgotten that entirely. But yes, it's a neat foothold for Edwige in current culture. It's "the killer who is a nymphomaniac"
See, that makes a lot more sense. That poster should be a light switch cover with blood running down from the switch hole. Huh. It would actually work really well for that. That trailer is not for "l tuo vizio è una stanza chiusa e solo io ne ho la chiave", it's for "L'uccello dalle piume di cristallo"
Actually, it is the right clip. YouTube has been doing this weird thing with and sometime playing the next clip in the queue. But only sometimes. I'm looking at it now and it's correct.